May 16 Making and Using Nettle Powder for Nutrition and Health...And How to Sneak It Into Your Family's Food! When I first heard the term, "Stinging Nettle" many years ago, I thought, "Yikes! Who would want to pick and eat that stuff?" It's true that this plant can cause some pretty severe reactions because of its "stings," and gloves must be worn when picking the plant---but the health benefits are absolutely amazing. So..why and how would you want to make and use Nettle Powder? Why are Nettles (Urtica dioica) so great for you? Why should you consider adding them to your diet? And how can you add nettles to your eating plan if you don’t grow your own fresh stinging nettles? How to eat your nettles when you don’t want to touch them in the first place? Find out how to make stinging nettle powder and add some nutrition to your healthy lifestyle! Why Should Stinging Nettle be a Part of Your Family's Diet? Nettle is full of nutrition! Stinging Nettle (Urtica dioica) is full of the entire spectrum of vitamins and minerals we need. In fact, it has so much calcium that it is an excellent remedy for growing pains in children. Nettle affects many other health issues, including but not limited to: gout, skin eruptions, detoxifying the body by strengthening and supporting the liver and kidneys, bone health, joint health, hay fever, anemia...and more! Nettle is definitely an all around champion herb when it comes to its use as a tonic as well as use for acute issues. Nettle was even cultivated by the ancient Greeks and used as one of their main sources of food as well as medicine. Yes, it is actually very safe and delicious to eat! It tastes "grassy," but vinegar, lemon, garlic, and spices can be added to make a delicious vegetable side dish. I just LOVE when an herb can be used as a delicious food source as well as medicine. Nettle, along with Dandelion, Burdock, Chickweed, and so many others can serve these dual purposes. As Hippocrates famously said, "Let thy food be thy medicine." What if you don't grow your own Stinging Nettle? It's a common herb, and very easy to purchase fresh-dried and organic, high quality Nettle. I buy my organic Nettle leaves from Starwest Botanicals. Nettles are pretty easy to grow, but honestly, I just don't want to deal with the "stinging" part right now. Maybe some day. But since Nettles are definitely part of our diet---through foods, teas, and tinctures---I love buying mine from Starwest! What if my family doesn't like Nettle (or any green thing)? Unfortunately, not everyone likes eating Stinging Nettle. After all, it's GREEN, which can factor into being a turn off for some folks, especially kids. It's also "different" by today's vegetable standards. If you are wanting to be sure your family gets enough greens, and especially with the high nutritional value found in Nettle, there IS a way to ensure they eat their nettles (or greens in general) without causing a ruckus. The answer? Powder your nutritive herbs and greens! I've been drying and powdering Nettle for years using a spice grinder. It's easy to sneak into all kinds of foods including casseroles, breads, smoothies, even cereal! You can sprinkle it on meats, salads, into salad dressings too. The possibilities are endless! And best of all: NO ONE WILL EVER KNOW! :-) Like many other herbs, Nettle becomes pretty tasteless when used in powdered form. Here is my Nettle powder on top of my stove! Always handy! Here's a picture of dried Nettle leaves and the powdered counter part! Nettle has the most beautiful green color! I also use it as a soap colorant when I make handmade soaps I want to be a beautiful emerald green. Step 1) Put your dried organic Nettle leaves into your spice grinder. Step 2) Grind until you have a fine powder. You can use a fine mesh strainer to sieve out any larger parts, but I really don't bother with this. Once it's in the food, it doesn't matter! Step 3) Pour your Nettle powder into a shaker jar, and sprinkle liberally away! That's it! How easy is that? I keep my shaker jar on top of my stove, and whenever I cook anything, I sprinkle some in! When I make smoothies, I'll use a tablespoon or two. That's really a LOT of Nettle leaves too. Getting your nutrition through food is really the best way to go. I'm not naysaying vitamins, mind you--I take these myself. However, there is just nothing better, more natural, and healthy than good old green plants for making sure your body is getting the best nutrition. If you (or your family) is concerned about whether or not you are getting enough greens in your life, then solving this problem is easy! Just powder your green, dried herbs and plants. And enjoy in and on your other foods. Sneaky, right? But in a very good way, I say. Have you ever used powdered herbs to cook with? What are your thoughts on using herbal powders? Leave a comment in the comments section! We'd love to hear from you. P.S. Don't forget to sign up for our Newsletter and never miss a thing! You'll also get my eBooks on herbal topics, using essential oils, and getting your homestead started all FREE and a LOT more in the password protected Resource Library! Enjoy! P.P.S. Have you been considering learning about Herbalism or how to become an Herbalist? If so, take a look at the Herbal Academy of New England. I love this herb school, and they have courses for every level and even a variety of specific herbal interests such as herbal fermentation or dealing with stress. If you've been wondering about learning about herbs....The Herbal Academy is terrific! Disclaimer: I am not a medical doctor or medical professional. I simply share my own advice based on years of study and experience for informational purposes only. Please see a doctor for any medical or emotional issues you may have. Please always do your due diligence and research any herbal or prescription medication you put in your body. If you are pregnant, nursing, or on medication, please check with your doctor before using herbs. Here is some Nettle powder sprinkled on my husband's eggs. When I flip them and the top browns, the Nettle is no longer seen! You can't really taste it, and YEP! It is being digested. What a great herb for vitamins and minerals! How can you use stinging nettles to increase the vitamins you get every day? Find out why nettle is such a useful medicinal herb...and also why you should include it in your daily diet. It's easier than it sounds! Just make up some nettle powder top have on hand, and you can sneak it into your family's food without them even knowing! How to make nettle powder--so easy! 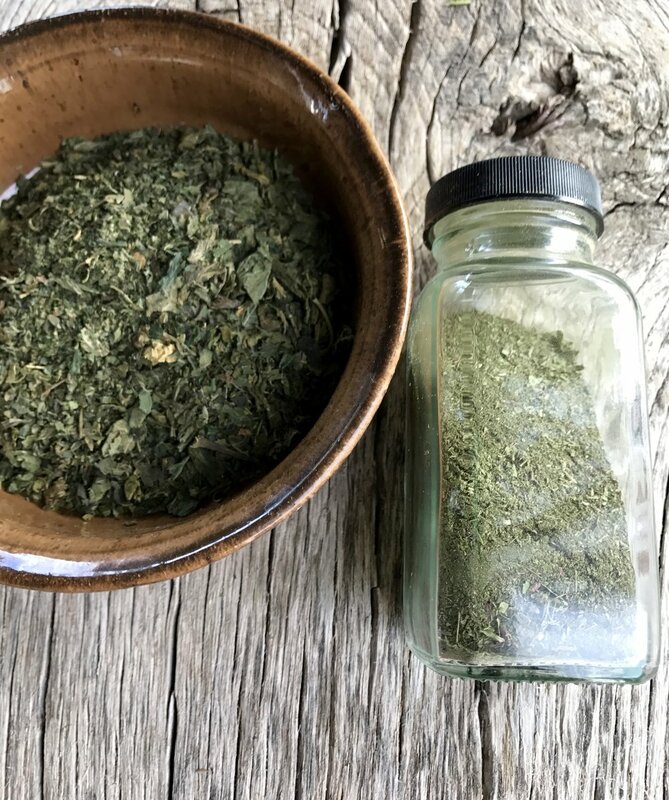 How to make and use nettle powder---You'll want to know why you should be eating nettles every day and how to easily get them into your diet without upsetting everyone with all the extra "greens." :-) Nettle is not just a medicinal herb---it is a nutritional powerhouse!